Last year I met Billy Morrison while shooting Billy Idol on tour in southern California. Not only did I really enjoy his playing but his stage presence was really fun to photograph. 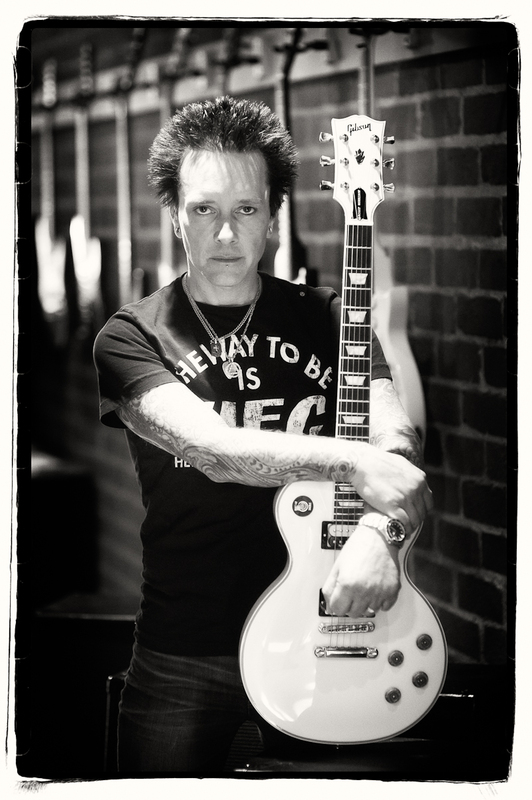 Since then I have photographed Billy Morrison with Billy Idol numerous times and got to go to NAMM with Billy to see his new Gibson Signature Les Paul. Last week I joined Billy in the Gibson showroom to shoot behind the scenes photos while Billy filmed some video for Gibson.com and some press shots for use on the website. I am really happy to say that the guitar has been officially released and video I watched being filmed is now on Gibson.com HERE. The information about the Guitar is HERE. This was a very interesting shoot for me. Other the some behind the scene shots during the filming of the video clip, I posed Billy in 4 different locations around the Gibson showroom and shot with natural light for 3 of them. One location needed some more punch, so I used an Sb900 with a small softbox off to the left. I arrived at the Gibson showroom early to check out locations for the portraits and I saw this wall of guitars that was lit from a glass door at the end of the hallway. In my head I could see Billy standing here with his guitar. The light from the door at the end of the hallway lighting up the background and the diffused lighting from the room illuminating Billy. I was careful not to have the overhead lighting directly over Billy’s face which would have caused shadows under the eyes and nose. I used Lightroom to pick out the one shot from this series that really stood out to me. My decision was based on the expression on Billy’s face and the look in his eyes. I then proceeded to process the image using Nik Software Viveza 2 and Silver Efex Pro 2. The images were sent to Billy and on to Gibson and as you can see from earlier they went with the Black and White version.